Clarence Flatt, an expert clockmaker, has asked for your help and has offered you the chance to explore the legendary Timeless Tower! While working on the incredible Ageless Clock, something goes wrong and pieces of the device end up all over the Timeless Tower. 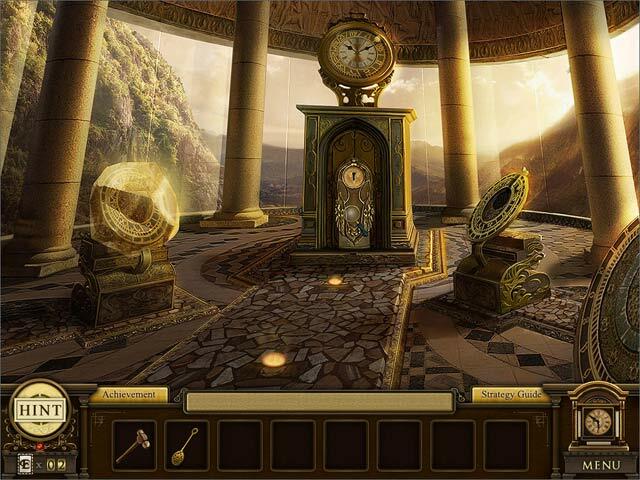 These pieces begin to unravel the very fabric of time, and only you can set things right in Enlightenus II: The Timeless Tower, a fun Hidden Object Puzzle Adventure game. This is a special Collector's Edition release full of exclusive extras you won’t find in the standard version. As a bonus, Collector's Edition purchases count toward three stamps on your Monthly Game Club Punch Card! 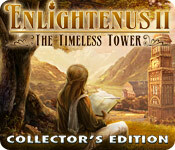 Enlightenus II: The Timeless Tower Collector's Edition is rated 3.4 out of 5 by 16. Rated 5 out of 5 by sinenomine_lj from Really solid sequel--refreshingly different HO game I have replayed this game many times. While not the world's most challenging game, it more than makes up for it with its unique approach and wonderful story. Rated 5 out of 5 by Yaelle from Exceptional I don't have anything to add to the other reviews. Enlightenus 2 has wonderful puzzles. In fact, I'm trying to get my whole family - ages 14 to 64 - to play the game to see how well they can do. Rated 5 out of 5 by arnold1049 from REVERSE HOG This game is definitely worth the money, because the bonus content includes another complete game, Forgotten Riddles: Mayan Princess. This bonus game had 19 levels and took me over 7 1/2 hours to play. I think I played it longer than the Enlightenus game itself. Yes, the scenes are repeated, but usually with different objects. I thought having to place objects into the scene, as opposed to finding objects as in a regular HOG was a neat change and certainly held my interest. I have found very few HOG's that don't repeat locations, unless they are very short. I had never played a riddle game before and really enjoyed this introduction to one in the bonus material. First you had to solve the riddle to figure out what object you needed to look for, then you had to find the object in the scene. At times, this was extremely difficult, as the items were very small. The storyline of the bonus game was excellent. So, a couple of firsts for me and that certainly held my interest. Rated 5 out of 5 by sapoe from another good sequel! I really have fun this game from beginning 'til the end. I think as usual this game have a good sequel again! I never get bored! Also all of this series is one of my favorite games I ever played! So thank you blue tea, for making this beautiful yet great series! Good job and love it! Rated 5 out of 5 by Gameritis50 from The BEST Blue Tea game This is far different from the games your used to playing. You are a reporter, and an old clockmaker contacts you to help him. With the help of the clocks you go back threw time to help him retrieve items that will help him change his future. I cannot recommend this game enough. Be sure and collect the enlightenus cards, if you want to skip a puzzle. Rated 5 out of 5 by HOGeek from Contrary to Recent Reviews After reading the latest reviews, I just felt I had to raise the rating bar of this game since it truly deserves a higher score for what it offers. 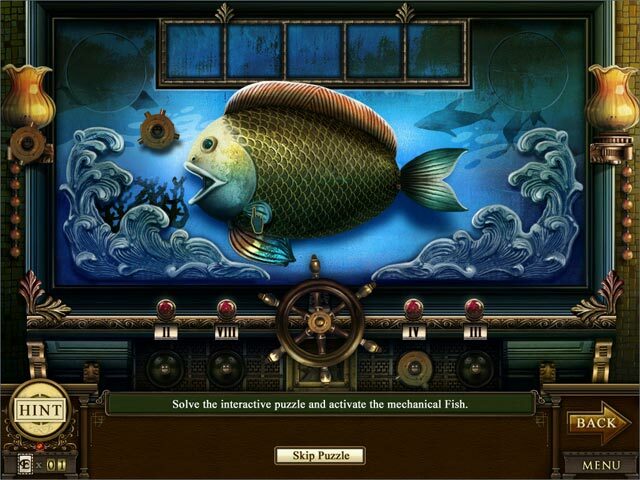 This game does have a different mechanism for solving hidden object scenes as the other reviewers already suggested, and it sure adds to to the level of difficulty and challege the gameplay offers. I've been playing HOGs for quite a while now, and Enlightenus II was one of those games I found quite rewarding in its Extra content. For the price of collectors' edition, you not only get the usual wallpaper\screensaver\music score\concept art\minigames items, but also a full version of Forgotten Riddles, and cheers to that! Also, although the Hidden Object scenes might get repetitve at times, the skip between different times and settings add to the fun factor reminds me of Echoes of the Past: The Citadel of Time#. Just thought I'll add my own impression of this wonderful game, but at the end of the day each player has their own preferences and expectations of the game offered to them. Rated 4 out of 5 by mrm2006 from I have been enlightened! After playing the first game of Enlightenus, I was so confused I wasn't sure I wanted to tackle this one. But, being optimistic as I am, try it I did and am very glad of it. Storyline: Clarence Flatt, a well-know clockmaker has asked that you visit him in the hospital. There he tells you about the Ageless Clock he has been working on. Unfortunately, while working on a mechanism, things went awry and clock pieces are everywhere in the tower. You must go throughout the tower and find all the necessary pieces to complete the Ageless Clock. Are you up to the task? You meet his hologram in the first instances of the game, get instructions and are promised the story of a lifetime. Off you go. Graphics: Although still on the dark and dreary side, the graphics have improved with more color and less monochromatic color schemes. However, items in HOGs are still impossibly tiny. Sound: Background music soft and relaxing. No side effects to speak of. Game Play: In order to find the pieces of the Ageless Clock you must go through the tower and enter different time periods, play an HOG, get a button and move on to a mini game now and then. Period - that's all you do. HOGs: Not your run-of-the-mill HOGs. As in the first Enlightenus story, you have to put items BACK into the picture. However, as in the first game, someone has a sense of humor because some of the items are slightly off-track, like a musical squirrel. You may also have to use several items before you complete something - for instance, give the comb to the Princess with the frazzled long hair, then give her scissors to cut her hair. You've now disposed of 2 items. Mini Games: Not many that I came across. All needed thought behind it. Explanations and instructions thought sometimes vague were better than the first game, which gave no instructions at all. You could skip the game but it would cost you several of the dear "E" cards. I finally found out what the "E" cards are for. They don't represent a "number" of hints you receive, but rather, if you click on an "E" card in your possession (by the hint button), it will cause the hint to recharge much more quickly. A good use since normally the hint button takes several minute - long minutes - to recharge. There are 2 E cards in every HOG. Impossible to find. I only got mine by happenstance. CE Bling: Usual stuff - concept art, wallpapers, music, and a full, complete story that I understand takes several hours in itself to play. The Strategy Guide in the demo did not work, unless the lag time was so bad when I clicked on it, it just took forever and a day to show anything. This Glam-ma was actually intrigued by this game. Much more so than the original. And, if not for the horrible lag time between EVERYTHING you do, I would purchase it in a New York minute - lol. Who knows, maybe sometime in the future, I'll have a hankering to revisit this game. The bonus game, which I understand is longer than the actual game, may be just the thing to wobble me onto the purchasing side of the fence - lol. I encourage everyone, especially those who liked the original game, to try the demo. It's only an hour - a very quick hour - and it is free. I think you will enjoy this version of the game much more than the previous one. Happy Gaming to All! Rated 4 out of 5 by Topper_ from A different take on the standard HOG This is a great game if you like something a bit different from the norm. Instead of searching HOS for a list of items you have to use your brain a bit more in this one and try to match an object with it's correct place in a scene. For example a bunch of bananas will go to a 'hungry gorilla' or a comb might belong to a maiden with tangled hair . I really enjoyed it The graphics are well done and there are other unusual mini-games, where once again you need to use logic rather than manipulation to get the correct result. The format is the same throughout all the levels of the game, so if you don't like the alternative style of game play in the first few instances I wouldn't recommend it, but if like me you get a kick out of solving logic puzzles then I'm sure you'll enjoy it. 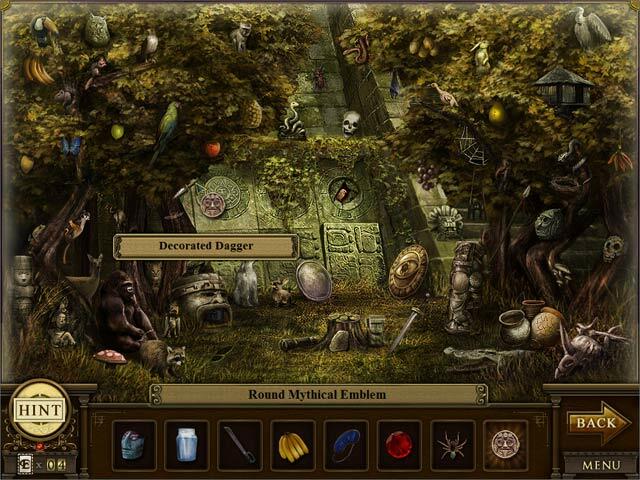 Rated 4 out of 5 by wendycecile from Something different Instead of hunting for a hidden object in a jumble of stuff, this game gives you strange little things to incorporate into a scene. It's kind of difficult to explain, but the scenes are of different times and places in the past, and you traveled there because you've got to find the missing pieces of the clock maker's masterpiece. You grab the odd little things and float them over the scene until you find something that might match up, but it's rarely obvious. I had a tiny violin to place, and it took me a while to find the "musical squirrel". If you're looking for a break from the typical HOS, you'll like this one! Rated 3 out of 5 by horsenbuggy from Decent little game to veg out with The gameplay is different in this game. You place the objects in the scene rather than finding them. Each scene is visited about three times. So there is some repetition. And the gameplay between placement scenes is not complicated at all. Basically, this is a game that's not going to challenge you but it's kinda interesting. The bonus game (that's still part of the Enlightenus world) is cool. It's set in the future, while all the scenes during the regular game are set in the past. I liked the future sci fi elements in the bonus game. I'd kill for more developers to create sci fi themed games! Clarence Flatt, an expert clockmaker, has asked for your help and has offered you the chance to explore the Timeless Tower!